One of the definitive bands on the summer festival circuit and at venues across the nation for nearly a decade, The Recipe have made performing live a way of life. Their jubilant spirit and celebratory music have created a devoted legion of fans that flock to the band.s shows and immerse themselves in the music. Having released three studio albums in their career, The Recipe returns with their first live document. All You Can Eat, on Harmonized Records, is fittingly dedicated to the fans. The band.s sound has evolved over the years, and All You Can Eat captures a critical time in their evolution. Their Appalachian .Porch Music. roots have matured into an effortlessly familiar concoction of great songwriting, sensible compositions, and tangible energy. 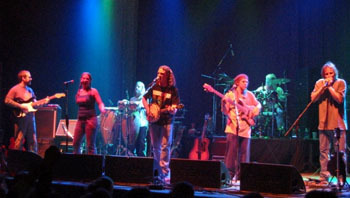 Recorded at various tour stops during the summer of 2003, the album will satisfy the rabid fans that have not heard a new album from the band since 2000. All You Can Eat is poised to become an essential release among live music addicts.